More than three million Syrians have fled the country and another 6.5 million are internally displaced, the top UN agency for refugees announced Friday. At nearly ten million, the total number forced from their homes amounts to nearly half the country’s total population. The organization warned that its own resources are being exhausted by the unprecedented exodus from Syria, which is the largest UNHCR has ever confronted. It is surpassed in number only by the five million Palestinian refugees, who receive aid through a separate UN agency. Those fleeing Syria are increasingly impoverished and desperate, UNHCR said, displaying signs of physical exhaustion and extreme fear. In many cases, families have been on the run within Syria for the past year before they reach the border crossings. The vast majority of refugees from Syria have gone by land routes to the three countries that border on its north and south—Turkey, with 815,000 registered refugees, Lebanon, with 1.14 million, and Jordan, with 608,000. Few refugees have moved east into Iraq, which is ravaged by its own civil war and where the border is closed, and even fewer have the resources to leave by air or sea to countries beyond the Middle East. The recent upsurge of fighting in Iraq and eastern Syria has not greatly increased the number of refugees, as figures nearly as high as these were tallied in a UN report on global refugee movement in late June (see: “Impact of war and persecution: More than 50 million displaced persons worldwide”). It appears that many refugees are still trapped within Syria by the increased fighting, as well as tighter enforcement of border security measures by Jordan and Turkey. The figure of 6.5 million internally displaced is likely a gross underestimate. 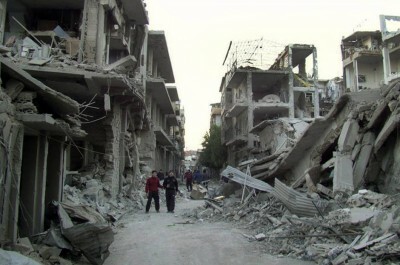 For example, in the city of Aleppo, one of the main battlefields, barely ten percent of the 2011 population of three million still remains in their homes. The refugee exodus is a human catastrophe created by the imperialist intervention in Syria that began with the US-sponsored destabilization of the Assad regime in 2011. Since then, the United States, Britain and France, together with US allies like Saudi Arabia, Turkey and Qatar, have funneled arms and other supplies to Islamist forces seeking to mobilize the majority Sunni population in an increasingly sectarian struggle against the Assad regime, whose military dictatorship has been based on political support from the minority Alawites, a sect linked to Shi’ite Islam. There is no doubt that stepped-up US military intervention, including the widely expected launching of air strikes and drone missile strikes against territory controlled by the Islamic State in Iraq and Syria (ISIS), will only exacerbate the humanitarian disaster in Syria. Anecdotal accounts by refugees newly crossing the border suggest the hellish conditions facing the Syrian population. Bread costs ten times what it did a year ago, and the cost of gasoline and fuel has also skyrocketed. The economy has virtually collapsed, and along with it, the healthcare system, once among the most advanced in the region. Fifteen percent of those arriving in Jordan cited long-term medical conditions like diabetes, heart disease and cancer as the reason for moving, because they could no longer obtain medical treatment or prescription drugs. Except for physical security, conditions are little better in the countries where they have taken refuge. Only 350,000 children are enrolled in school, although children comprise an estimated 1.5 million of the refugees. Only 400,000 people are in official shelters, with the rest either sleeping in the open, or crowded into the poorest urban areas of Beirut, Amman, Antakya and other cities. António Guterres, the UN High Commissioner for Refugees, said the Syrian crisis “has become the biggest humanitarian emergency of our era, yet the world is failing to meet the needs of refugees and the countries hosting them.” The supply of aid is “far short of what’s needed,” he said. Donor countries and organizations have provided $4.1 billion in aid since 2012, a sum that amounts to less than $700 per person per year based on the current refugee population. UN officials said that $2 billion in additional aid was required, including winter housing for 2.4 million people.